This is renewme skin clinic. During winter, people need for sagging skin with no tighten. so we recommend the new technique of lifting treatment called THERMI-RF. The treatment has more strength than other lifting laser like Ultherapy and thermage treatment. Thermi RF is a unique temperature controlled radio frequency technology designed to safely produce through the science of heat. It's advance real time temperature monitoring to apply soft tissue for lifting. Thermi-RF is a skin tightening and lifting treatment using radiofrequency energy. 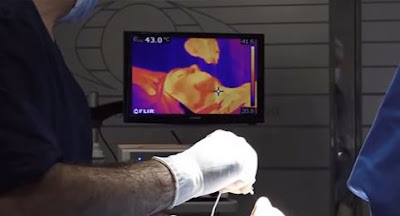 The tiny probe is inserted underneath the skin and is used to heat radiofrequency energy in layer of the target area. At the temperature range in the deep dermis, collagen production in your skin is dramatically increased and stimulates new collagen regeneration and tightens sagging skin The results are skin firmer, tighter, more elasticity. What is the principle of Thermi RF? What is the advantages of Thermi RF? Wrinkle / Tighten / Lifting Renewme Skin clinic Thermi RF! If you have any questions about Thermi RF, feel free to contact us via messenger.